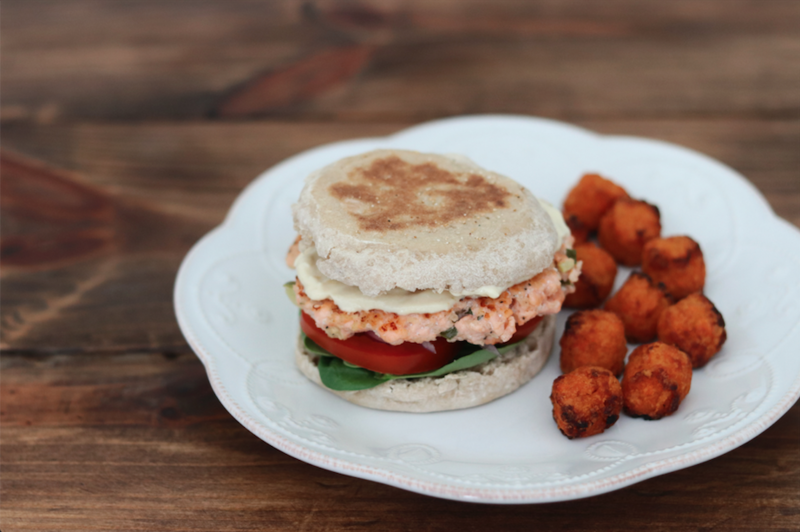 Looking for a simple and tasty Easter Brunch recipe? Look no further! This recipe uses seasonal ingredients and can easily be made in advance, leaving you free to enjoy the morning. In my opinion, Easter and brunch go together like peanut butter and jelly. Spring is in the air, and that means we’ll soon be seeing so many wonderful seasonal ingredients in grocery stores, including fennel, grapefruit, strawberries, kale, parsley, spinach, Vidalia onions, and various herbs. I get so excited when more warm-weather produce starts to appear in stores, and I begin looking for ways to incorporate the ingredients into my everyday dishes – like this quiche recipe. 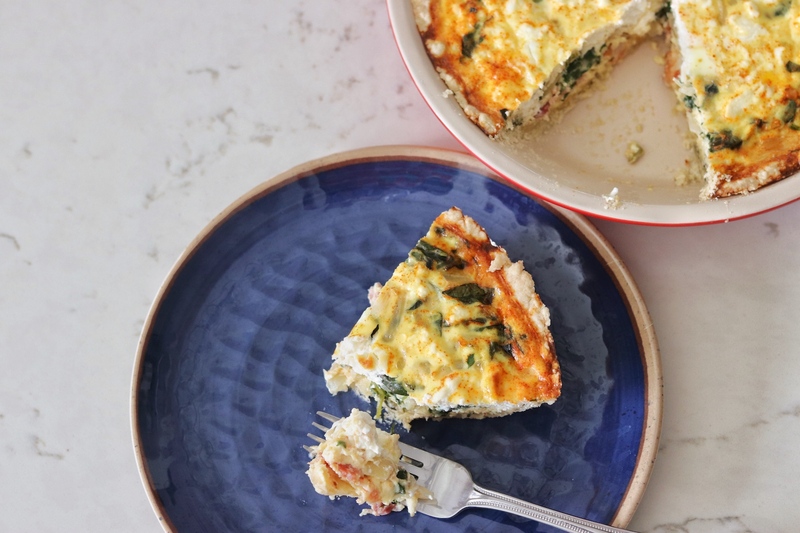 Many quiches are high in saturated fat, with buttery crusts and heavy cream, but with a few beneficial swaps, we’ve lightened up this classic Easter brunch recipe. Many of the seasonal ingredients mentioned above are incorporated as well, including spinach, onion, and thyme. For the first healthy swap, we used center-cut bacon rather than regular. I personally love bacon and believe it adds so much to this dish. Center cut bacon contains 50% less fat on average without sacrificing any of that wonderful flavor. We also suggest pouring off some of the drippings before adding the greens. Once again, this doesn’t sacrifice any flavor, it just reduces the amount of saturated fat. In addition, we modified the crust recipe to be made with olive oil rather than butter. Olive oil is a good source of mono-unsaturated fatty acids that have been associated with a slew of health benefits, such as reduced risk of heart disease, reduced inflammation in the body, less risk of atherosclerosis and high blood pressure, and more. Adding thyme to the crust boosts flavor and boasts healthy benefits, such as respiratory health and having soothing effects on the stomach. 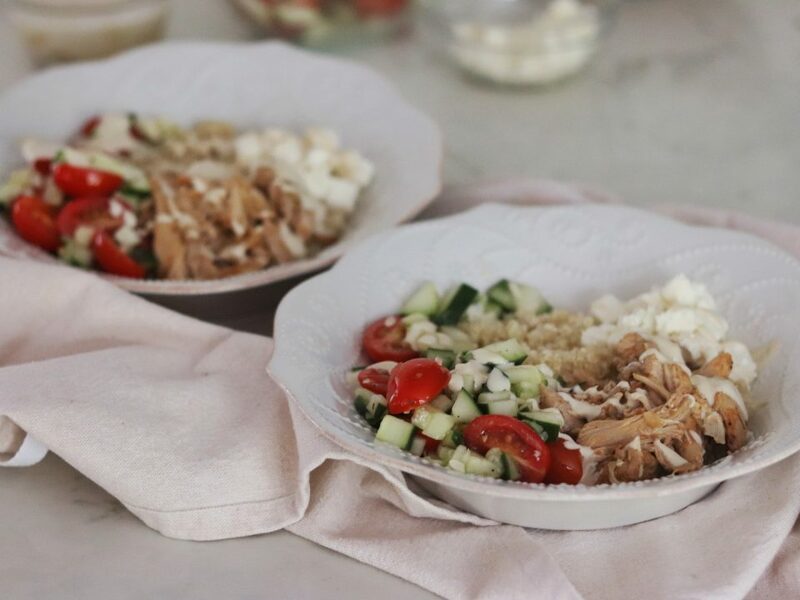 I love this dish because it is comforting and nutritious at the same time. 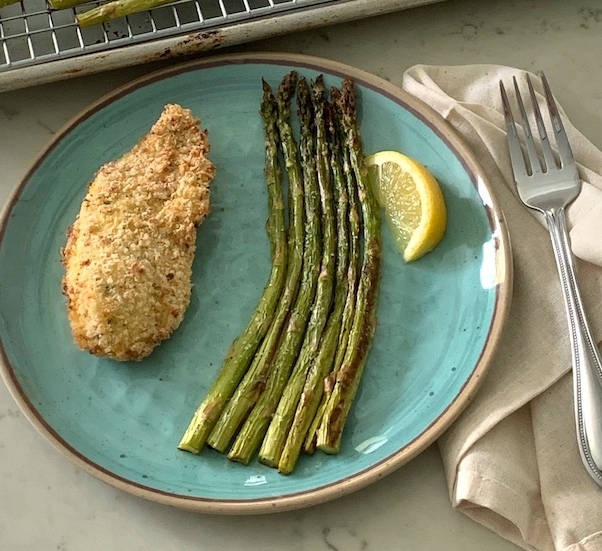 Protein-packed eggs, calcium-rich milk, fiber- and vitamin-filled greens, and antioxidants in the onion can all make you feel good about serving this dish to your guests. 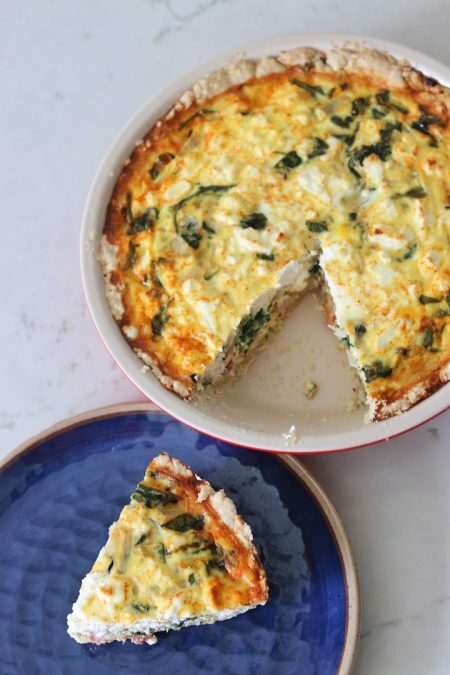 You can also make this quiche ahead of time to have on hand for breakfast all week. In addition to all of this, it’s always a crowd-pleaser! 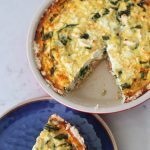 Make this recipe gluten-free by leaving the crust out all together and pouring the ingredients directly into a sprayed pie dish (frittata-style). What’s your favorite Easter brunch recipe? Do you traditionally cook or go out to eat with relatives? 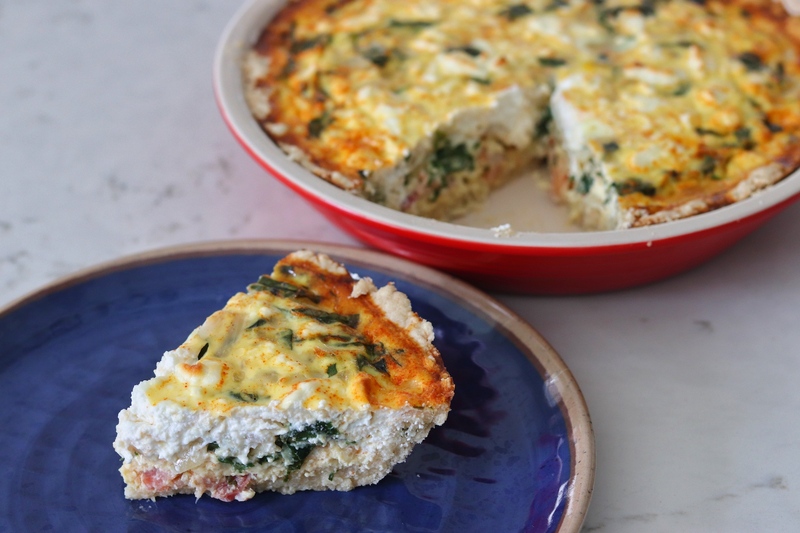 Let us know in the comments below, and send us pictures if you make this recipe, quiche or frittata (crustless) style! Preheat oven to 350˚F. Whisk together flour, thyme, sugar, salt, and baking powder in a large bowl. 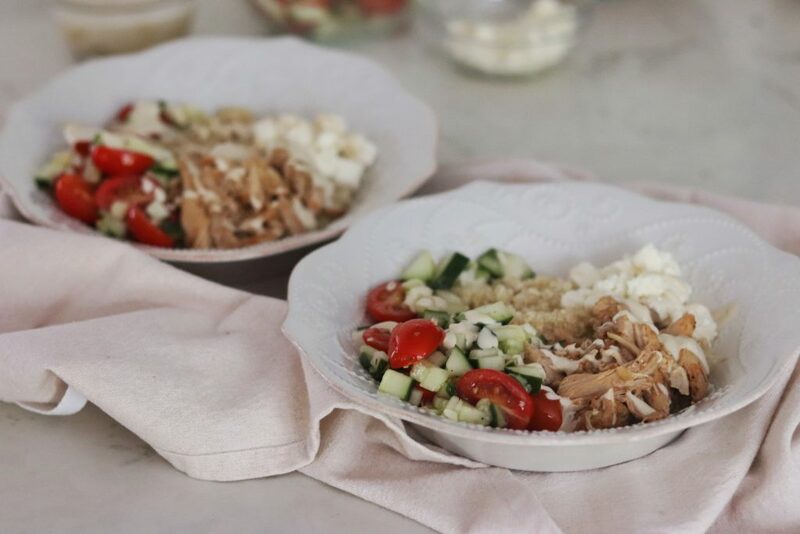 Whisk together olive oil and water, and pour over dry ingredients, stirring with a fork until moistened. Press crumb mixture into a 9-inch pie plate coated with cooking spray. Crimp the edge or flatten with the tines of a fork. Cook bacon in a large skillet over medium heat until crisp, about 6 minutes. Transfer bacon to a paper towel-lined plate, reserving 1 tablespoon drippings in skillet; discard any remaining drippings. Crumble bacon, and set aside. Add onion to drippings in skillet, and saute over medium heat about 8 minutes or until tender and golden brown. Add spinach, and cook, tossing frequently, just until spinach wilts. Spread spinach mixture over crust in pie plate; top with crumbled bacon. Whisk together eggs, milk, mustard, salt, and paprika. Pour egg mixture over spinach layer in pie plate. Crumble goat cheese over the top of the quiche. Bake 40 to 45 minutes or until set in center. Cool slightly. Cut into 6 wedges. To check for doneness, just use an oven mitt to give the oven rack a shake, and you’ll know the quiche is done when it no longer jiggles in the center.